How a Business Results Specialist can help you to define clear goals and set the perfect plan in motion to accomplish them. If you’re a prospective client and we’re meeting for the first time, I’ll introduce myself as the Business Results Specialist. Yet it’s difficult to fully convey what that moniker could mean to you without further explanation. As such, I’ve taken it upon myself to clarify exactly what I’m here to help you achieve, and how it’s critical to your success in working with an agency. What Does a Business Results Specialist Do? As the Business Results Specialist, my job is to better understand clients’ and prospective clients’ needs, situations, and goals, and communicate them clearly to our team so that we can deliver optimal success. Deliver success…what does that mean? It’s my job to find that out. What does success look like? We need to define your goals before we can develop a plan to solve your business problem(s). Your goals ought to be S.M.A.R.T. : specific, measurable, achievable, relevant, and time bound. In an attempt to understand your goals, I will be asking questions. Asking questions allows me to become familiar with your business, goals, plans, challenges, and timeline. But it also helps you better understand your goals, how well they fit the S.M.A.R.T. criteria, and what it will take to achieve them. It’s one of our core values to leave people better than we found them. Helping people define success for their business by asking the right questions is one of the ways we do this. That’s why we’ll often share our business assessment form with prospective clients. Our business assessment form is a valuable series of questions that clients need to answer before we set out to solve a business problem with digital marketing. It helps you define success, helps us better understand your goals and objectives, but it also gives us a clear structure so that we can help you prioritize accordingly. If it turns out that we’re not the right fit for you, that’s absolutely fine. And you are welcome to take the PDF of your business assessment answers with you as you find a solution that does fit. The important thing is not that we obtain you as a client, it’s that you’re closer to achieving your goals. How Is a Business Results Specialist Different Than a Traditional Salesperson? There are some differences I’ve noticed in my experience that I’d like to share with you between the role of a Business Results Specialist and that of a traditional Salesperson. My intention here, please understand, is not to make generalizations about salespeople, but to share some insights from my personal experience. As a Business Results Specialist, I prioritize good fit. Together, we’ll decide whether we’re the right agency to help you. It sometimes turns out that we’re not, and that’s okay. Let’s face it, in a typical agency model, a lot of client-agency relationships turn sour. That’s often because a typical agency has typical salespeople who prioritize closing every prospect without regard to fit. It’s also important to keep in mind that a true Business Results Specialist who prioritizes fit can’t exist in an organization that prioritizes closing every prospect. I’ve been a part of sales organizations in the past with fear-driven cultures. In an environment where a salesperson is afraid to not close a deal, it’s very difficult to prioritize fit. Uhuru is a business ecosystem that not only allows, but encourages prioritization of fit. That’s good news for you as a potential client. It means that your business success is the priority. That’s why we prioritize your goals so highly, and spend much of our time exploring them before coming up with a plan. It’s why we take a consultative sales approach, and encourage people to answer the questions in our business assessment form. In fact, we only work with clients for whom we are 95% confident we can have a significant impact. This is good news for you! It means we will never begin an engagement thinking, “Well, I hope this works.” No, we’ve done our due diligence, we have a plan and a strategy and at least 95% confidence that the impact will be significant. The other side to that coin, though, is that if you don’t have clear goals, we may not be a good fit to help you. How can we have the confidence we need in helping you achieve your goals if your goals are unclear? If you consider your website as merely a billboard online to tout your wares, and you’d like someone to simply spruce it up a bit, it sounds as if the desired outcome isn’t attached to measurable business goals. As such, we may not be a fit to help you. You may have heard similar sayings such as “It’s about the journey, not the destination.” Well, we’re results-driven, so we’re not going to take it that far. But, as a prospective client, there is value for you in our process. The value is in how it helps you achieve your goals, whether you end up working with us or not. The first way our sales process helps you as a prospective client, is that it reinforces and specifies your goals and what it will take to achieve them. Sometimes it’s necessary, for example, to show just how much it takes for inbound marketing to be effective—you can learn more about the Full Inbound Conversion Funnel in our article here. As we’ve said, this is a critical step that must be accomplished before beginning to create a strategy to achieve your goals. The second way our sales process benefits you, is that it helps us help you. We learn more about your business and are better prepared to consult and make recommendations that will help you achieve your goals, whether you end up working with us or not. The third way our sales process helps you is that—as I explain in “An Expert’s Guide to Creating a Highly Effective Sales Process”—my role as the Business Results Specialist doesn’t end once you become a client. This is different from every other sales position I’ve ever had. At Uhuru, I prepare our team with relevant information from our conversations during the sales process so you’ll be less likely to repeat yourself as we kick off your program. I also join your kickoff call, strategy sessions, and am involved in most of your calls as we get you ramped up. I’ll also stay in touch regularly to ensure everything is going smoothly. Now that you better understand my role as a Business Results Specialist and how I can serve as an asset to the discovery of your goals and objectives, let’s hop on a call. I’m here to help you explore your goals and better understand what it will take to achieve them, as well as to prepare our team to execute a plan for success. 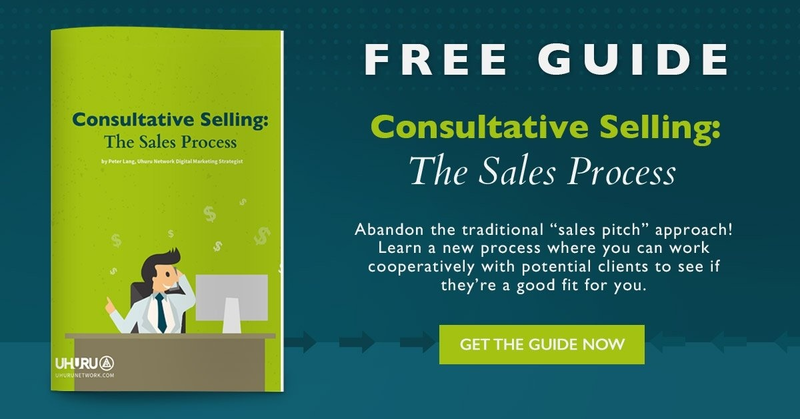 At the very least, we’ve shared with you the activities and typical responsibilities of the Business Results Specialist, as well as the skills and traits necessary to run a successful consultative or challenger sales process. It’s up to you to determine what’s right for your business. Know that I’m here to help, and want to ensure that you’re set up for success.